Shopping for Knex Construction Toys? Explore STEM concepts while building a working Roller Coaster! 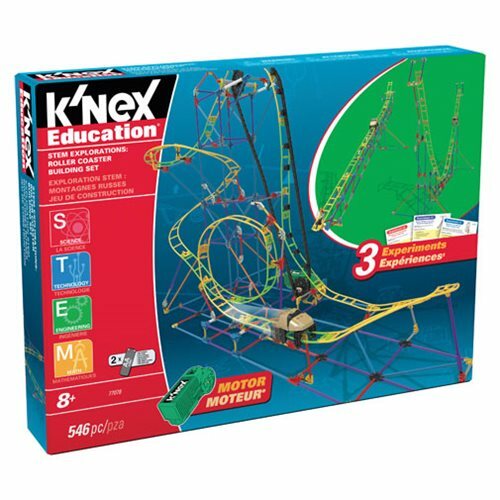 Using the materials included in this set, middle-school aged children will be engaged and energized as they further their knowledge and understanding of the science, technology, engineering and math concepts associated with a real-life amusement park ride. The set includes over 500 parts plus a battery-powered motor, plus 2 additional models (a Ramp and a Half-Pipe). Each model can be built one at a time. Once built, a downloadable booklet guides students through 3 hands-on, inquiry-based experiments on each of the models. Students will learn about the relationship between time, distance and speed plus much more! The Experiment Guide is aligned to national STEM standards and is appropriate for grade levels 5-9. Requires 2x "AA" batteries, not included.